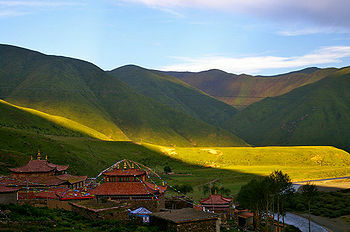 Mardo Tashi Choling Monastery is located in the Golok region of Amdo, Eastern Tibet. Built more than two hundred years ago, it is one of the four main branch monasteries of Katok Monastery, the oldest of the six 'mother' monasteries of the Nyingma. Mardo Tashi Chöling was the home of the great tertön Dudjom Lingpa (1835-1904) and of the succession of reincarnations of Katok Dampa Rinpoche, starting with Gonpa Lama Chökyi Dorje. Sublime being, listen to me! The stars and planets will be well aligned for building your home. The time isn’t right for construction? Neither good nor bad circumstances will arise. When the third day arrived of the first autumn month, I assembled scores of workers and we went about laying the foundation for my home. While we dug the foundation for the Dharma Protectors temple, we found a trio of precious gold, turquoise, and conch, a trio of copper, silver, and iron, as well as agate, rubies, lapis, coral, and more. Some jewels we could identify and some we didn’t recognize. Their sum overflowed from a small trough. I understood this to be an auspicious connection indicating the increase of our merit and wealth. Under the foundation for the storehouse we found three human skeletons of different sizes and pearl garlands strung together with copper wire. Although the interdependent indications for the protector temple were excellent, it wasn’t in line with the edge fo the house. Since this wasn’t good, I didn’t build it there. When the house was complete, a mad monk arrived. To examine the portents, I ordered him, “Go to the Mar River, find an unusual stone, and bring it back to me.” He left and returned that night carrying a maroon river stone shaped like a human ear. Temporarily form a Buddhist center and stay there. This moving of your residence is a result of auspicious connections. Aware of that, think about the meaning [of those signs]..
During the unrest in Tibet, the entire monastery was destroyed. Today much of the monastery has been restored, such as two temples and a residential space for 160 monks. ↑ Dudjom Lingpa, ‘A Clear Mirror’, The Visionary Autobiography of a Tibetan Master’, The Outer Autobiography, translated by Chönyi Drolma, Rangjung Yeshe Publications, 2011, Page 125-127. This page was last edited on 6 April 2016, at 21:50.